Good Housekeeping tried and tested multiple steaks in order to find the best sirloin to enjoy on Valentine’s Day. A total of 16 steaks were cooked and eaten (not a bad way to spend the day). It doesn’t matter how you like to cook your steak, rare, medium or well done, what matters is the meat itself. Good Housekeeping recommends focusing on the age of the steak. The more aged the meat the richer the flavour will be. Steaks aged between 21 to 30 days provide a more interesting flavour, but if it’s too aged the meat may end up being too touch or flavourless to enjoy. When Buying a Steak Good Housekeeping recommend buying a sirloin steak with a dark red colour and a rim of firm white fat around the edge. The best example of this is the Co-op 28-day matured Hereford Beef Sirloin Steak, which came out on top of the Best Sirloin survey, scoring 90 out of 100. 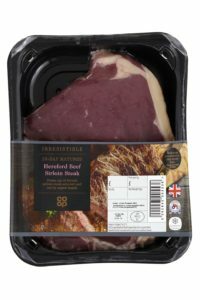 The Hereford beef sirloin steak available from Co-op for only £4.50. Good Housekeeping said the sirloin was deliciously rich and had a slightly salted aroma that was appreciated by the testers. Additionally, the found the Hereford steak to be extremely juicy and succulent. Both two words commonly associated with Hereford beef. Click here to read the full feedback provided by the GHI test. If you’re looking to impress this Valentine’s Day, we suggest treating your significant other to a Hereford beef sirloin steak. Show us your Valentine’s steaks over on Twitter and Instagram using #Herefordbeef and tagging @Herefordbeefuk in your images.